EASY 412 Klockner Moeller Programmable Ladder-Logic Controls. 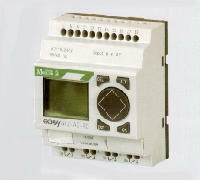 Stocking Distributor: Klockner Moeller EASY412 programmable ladder-logic controllers - PLCs. best prices in the USA! Dimensions: 2 ¾" by 3 ½"
8 inputs connect to ordinary pushbuttons, remote limit switches or any type of control device. LCD display shows actual wiring diagram. Programming is done right on the unit. Optional Windows software includes function simulator. On the DC versions, 2 inputs will also accept analog signals (0-10 volts) and have programmable setpoints. A single EASY412 Relay can replace an entire control panel of 16 control relays (120 contacts) plus 8 timers plus 8 counters plus a time clock! The inputs connect to 8 pushbuttons or limit switches or safetys or remote switches, and the 4 relay outputs can control 4 motor starters. All in this one tiny inexpensive package!! So simple that Mom can learn to program it in 10 minutes! Note: Master & slave units plug directly together side-by-side, or use EASY200-EASY for 2-wire connection up to 30 meters in length. Prevents on-site tampering. Lower cost.